This unique pendant could pass as a secret symbol, when in fact it is a cleverly disguised monogram. The Classic Monogram Pendant in Sterling Silver features up to three letters of your choice arranged together in a circular pattern, in a completely original way. At first take, it is an intriguing piece that holds much appeal. Overall, the round pendant measures 25mm by 25mm (not including bale). It is made from solid sterling silver, which is carefully cut to create the bold initials and the exterior round border. Much attention is paid to stylizing each letter and to making just the right curves, cuts, and lines. The sterling silver pendant is polished to a high finish and attaches to a bale for a chain. This classic monogram pendant is a fashionable piece that is a great way to add more sterling silver to your jewelry collection. The pendant can be worn as a casual accessory or as an easy way to dress up an outfit just in time for a big night out. The personalized pendant hangs beautifully around the neck and makes for a great statement about style and individuality. 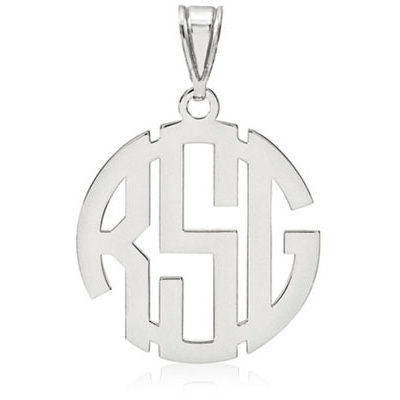 You simply can't go wrong with this silver monogram pendant. Pendant measures 25mm (1") x 25mm (1") not including bale. Total length of pendant is 37mm (1 +") including bale. We guarantee our Classic Monogram Pendant, Sterling Silver to be high quality, authentic jewelry, as described above.